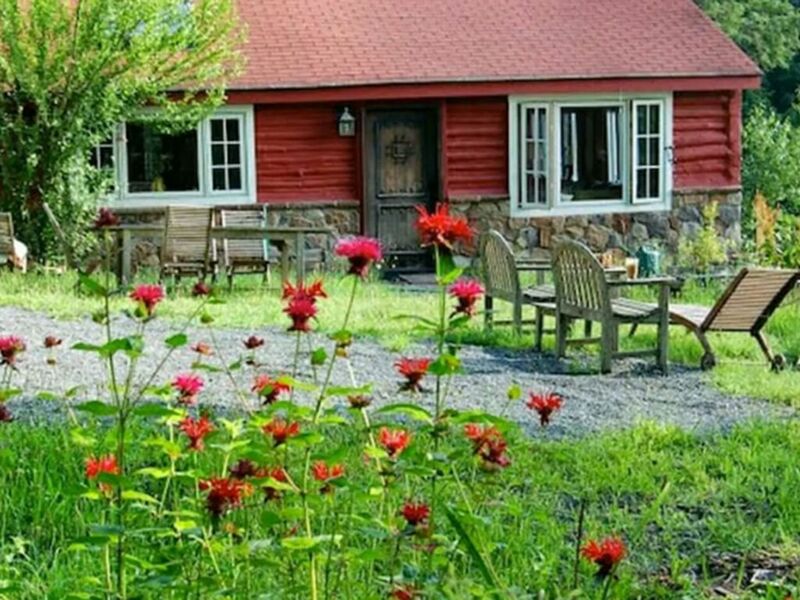 Experience total privacy and relaxation in our magical log cabin on 10 acres of woods, 90-minutes from NYC! Our home sits atop a bedrock cliff, with gorgeous, untouched Shawagunk mountain views and the peaceful sounds of the river and 30-ft. waterfall running below. The cabin is wonderfully cozy yet feels spacious, rustic while having every modern amenity provided to you. Enjoy total seclusion close to so many things to see and do! This adorable 1951 red log cabin oozes charm, with so many little places to hang out. Make your morning coffee in our modern kitchen, then relax on the deck directly above the waterfall, watching the sun rise over the mountain. Laze away on our outdoor chaise lounges, while watching the hawks or glider planes soaring overhead. On a rainy day, enjoy the screened-in breezeway with a warm wool blanket and a board game. Fire up the BBQ and grill local veggies, then dine al fresco under the stars. Unwind with a bubble bath in our claw foot bathtub, while sipping a glass of organic wine from nearby Bashakill Vineyard, and looking up at the stars through the giant skylight. Pop some popcorn and put in a DVD from our collection before snuggling up on our super-comfy couch. Stop and enjoy Woodbury Commons (jct hey 87 and 17) or Castle Family Fun Center (go-carts, mini golf, on rte 17) on your way up or back from NYC! Sit back, relax, enjoy yourselves. Make our special and unique home yours. We also host a Tentrr site on our property. Check it out! -Feel free to use our Netflix, Amazon Prime or Pandora accounts on Roku. -Modern kitchen with every utensil and appliance, including dishwasher, coffee maker, blender, microwave, farmhouse sink. -Spices, grilling condiments, vinegars, oils. -10 acres of woods and nature to explore- walk alongside our spring-fed stream stocked with trout. Map provided in Cabin. *Be careful of treacherous terrain, no waterfall access. -Cabin is heated, but no A/C. We have plenty of fans, and the cabin usually gets a good breeze through it with the windows open. -The sectional sofa can sleep 2, and there is an extra sofa for sleeping. -Large claw foot soaking tub. -Explore the nearby BashaKill Wetland, then on weekends the BashaKill Winery next door! -Toys, games and books for toddlers/young children. -3 minute drive to downtown Wurtsboro with large G-Mart grocery store, Health Food Store, gas station, Dollar General, Chase Bank, liquor store, pharmacy, cute shops, etc. -Explore the famous ice caves at Sam's Point Preserve- 15 min. drive. -Danny's restaurant in town- local charm since 1814! -NOTE RE WINTER: depending on snow/winter conditions, we may ask for you to park at the landing literally right past the driveway entrance. It is roped off by yellow rope. Then we would ask you to bring boots to carefully walk down the driveway to the cozy winterscaped cabin. We will notify you if this need be the case. Thanks for your understanding! -Please note the fireplace is INOPERABLE at this time. Sorry for the inconvenience! -No swimming for liability reasons. -No shower, only bathtub with handheld wand. -The stairs to the second bedroom/loft are quite steep. This area is not recommended for children or the elderly. -Cigarettes only allowed outside on gravel seating area. Extinguish only in ashtrays provided. Foliage is extremely flammable. -The cabin sits atop a steep cliff. Extra caution must be taken, particularly with children. No access to back part of cabin due to cliff. -Gravel driveway is steep. Be careful not to slip or spin tires. -During tick season, repellent is highly recommended. Lyme disease is prevalent in the region. We have spray in cabin. -Brown bears are prevalent in region- take provided air horn when hiking. -In bad weather, power can be unpredictable, but we now have a generator that kicks on automatically and can run the entire cabin for up to one week. We primarily live in the 5 boroughs. We love adventuring and taking time to enjoy nature. We hope you enjoy your time at our special place in the woods! This property is truly special and restorative. It has untouched mountain views, and hearing the waterfall roar below you is like nothing else. A NYC ballerina built our cabin in 1951. You can feel the history when you are there. toilet, tub, Huge clawfoot tub. There's a handheld wand for rinsing. 10 acres of gorgeous private woods. Modern amenities 3 minutes from cabin include large grocery store, health food store, Chase bank, 2-3 restaurants (including pizza and chinese), library, vet, laundromat, gas station, ice cream stand. Gorgeous, unspoiled mountain views on private property. All linens and blankets provided. Inoperable at this time - sorry! Fits up to 3 cars in driveway. Free wifi in cabin. Feel free to use our DVDs, Netflix, Pandora, Amazon Prime. Towels for both indoors and outdoors. Very spacious living room with super comfy couch. Basic pantry items such as spices, sugar, oil, vinegar, condiments provided. All dishes and utensils provided. Gorgeous, modern kitchen with stainless steel appliances, farmhouse sink, granite countertops. All cooking supplies and basic vinegars, oils, spices, condiments provided. Coffee provided. DVD collection, Roku with access our Netflix, Pandora, Amazon Prime. Atari game. Record player and records. Please do not let children play with the records, they are special to us! Some books on local history, sights and wildlife. Plenty of cookbooks. Some children's books. A chest full of games is in the living room. A chest full of childrens toys in the living room. A variety of DVD's provided. Atari joystick provided with 5 games. Stellar hangout area with unspoiled mountain views. Peaceful deck off of the back of the house directly above the waterfall. Only allowed on gravel area outside using ashtray. Very cozy and comfy cabin in a blissfully quiet and scenic location- easy to get to and all the comforts... especially great that we could bring our dog! the sound of the waterfall is a plus! This proved to be the perfect place to get away from the city for a few days. The view is spectacular and the cabin very comfortable. Our hosts were amazing, making sure we had all the information we needed prior to arrival and answering the few questions we had instantly. It must be a wonderful place to spend time in the summer. We loved learning about the history of the cabin and all the things to do in the area. We had an enjoyable day birding at Bashakill Preserve, only a 15 minute drive away. Also appreciated the fast, reliable wifi and Netflix for cozy nights in. Couldn't be happier with our stay! This exquisite land and adorable cabin would be ideal if there was running water and electricity which at the price per night is something a guest would completely expect. during our stay electricity went out on the second evening and there was no way to fix it before we packed up the car to leave early the next morning instead of enjoying our stay. the property owners stated that it is normal in the mountains to lose electricity and therefore lights water etc. if this is normal then there should be a back up generator immediately ready for guests or it should be advised in advanced that if you require electrucity or running water for toilet or kitchen to beware. I was very disappointed in how it was handled by the owner, basically rent at your own risk. They reimbursed $50 even though 1/2 of the time of our trip was ruined. We had people who medically needed running water and the owners told us if they knew that in advance they would have told us to rent elsewhere. We're sorry you had an unsatisfying experience on the last morning of your stay. I was notified by Orange & Rockland Utilities that the electricity went out because of weather in the area at 6:14AM on your last morning and was restored a few hours later at 9:29AM, about 10 minutes before you texted us that you had left the cabin at 9:40AM. As mentioned in our write-up, "In bad weather, power can be unpredictable. There is no generator." We also mentioned we were in the process of setting up a generator and we now have one fully operational, ready to run the cabin for up to a week. As far as us telling you to "rent elsewhere", we were extremely surprised and worried to find out AFTER the power had gone out that there were guests with special needs. Chrissy was particularly worried while on the phone with your friend, and again, trying to help. Later, when you contacted us again, we did mention that if we had been informed in advance that people staying with us had special medical needs, we may have advised you to not book a secluded cabin in the woods, as power is more likely to go out in that type of environment. It is hard to help and properly advise if we do not have the information in advance, as was the case here. Again, we are sorry for the inconvenience and the unpredictable weather. We thought a refund of the $50 cleaning fee was appropriate for the three hours the electricity was out; I'm not sure how you calculate that half your 3 night trip was ruined. Good luck to you, Pamela. We had a lovely time, just what we were looking for, close to the city, but far enough away to be in the mountains. The cabin is well kept and very private. It was great to hear the waterfall even though we could not actually see it. We stayed in most of the time because of rain but still managed to have a couple of barbecues! What an absolutely beautiful cabin in the most breathtaking mountain setting. We kept saying this is exactly the place we would want to own. The decor, the lovely and detailed history, and the attention to detail...not to mention the bath! We loved our stay. The hosts are available and so nice we felt a personal touch on everything. Be mindful with small children - I could hardly relax with the steep mountain edges right outside and a little one running around (we were well aware of the drops in advance.) All in all the most idyllic cabin and location and a great natural food store in town. Wonderful experience we would definitely return. Each night we slept deeply, lulled to sleep by the roaring waterfall below us. This is a spectacular setting. We had a lovely time and the house far exceeded our expectations. Only two things to note ... first, the bath has a hand held shower. Only a slight inconvenience, but one that was not anticipated. Second, the stairs to the upstairs bedroom are quite steep. Neither of these impacted our enjoyment of the amazing location. But two slight inconveniences of which you should be aware. I wouldn't let them impact my decisions to stay here unless you have small children, or have physical limitations that make the second bedroom inaccessible. Thanks for a lovely time and we will be back next time we are in the area. Woodbury Commons on the way up from NYC on Rte. 17. Castle Fun Center on way up. Sam's Point Preserve has amazing hiking, ice caves, and views. Bashakill Wetland Preserve has hiking, kayaking, bird watching. Bashakill Winery has live music on weekends in summer.